Ministry of Skill Development and Entrepreneurship (MSDE) here today celebrated the second anniversary of Skill India Mission on the World Youth Skills day. 100 GST training centres, 51 Pradhan Mantri Kaushal Kendras and 100 Yoga training centres were inaugurated on the occasion. SKILL INDIA Mission is the brainchild of Prime Minister of India, Shri Narendra Modi. It was during his presence, MSDE had launched the SKILL INDIA Campaign on the occasion of the first ever World Youth Skills Day on 15th July 2015. Minister of State ( I/C) MSDE Shri Rajiv Pratap Rudy hosted the celebrations and the Union Ministers present as the Guests of Honour were Sushri Uma Bharati, Shri Jagat Prakash Nadda, Shri Narendra Singh Tomar, Smt. Smriti Zubin Irani, and Shri Dharmendra Pradhan. “This year we will focusing extensively on quality, our schemes and programs have to orient themselves to seeking regional balance so that maximum number of people can reap the benefit and add to their personal and the country’s economic growth. We are committed to the vision of our Prime Minister with full passion, integrity and commitment to make it into a success. Our endeavor will be to give wings to the dreams our people and empower them to be successful in their life,” he further added. The event saw prominent Industry captains and key representatives of companies participate and more than 32000 companies pledged support to apprenticeship training for Skill India Mission under the National Apprenticeship Promotion Scheme (NAPS). MSDE also announced the launched of National Apprenticeship Promotion Scheme (NAPS) in BFSI Sector and along with candidates receiving their apprenticeship letters at the gathering. On the occasion, Ministry of Skill Development and Entrepreneurship (MSDE) announced a national training Programme to certify GST practitioners under its flagship scheme of Pradhan Mantri Kaushal Vikas Yojana (PMKVY). This would facilitate the country’s transition to the new tax regime seamless and convenient. Total 100 GST training centres across the nation were launched along with the training curriculum. In line with the commitment of opening one Pradhan Mantri Kaushal Kendra (PMKK) in each district, additional 51 PMKK were announced across India counting to 200 in total till date. Staying true to Shri Narendra Modi’s commitment to promote yoga, MSDE also launched 100 yoga training centres on the occasion. Minister for Health and Family Welfare Shri Jagat Prakash Nadda said, “Development is an on-going process but becomes crucial when the country has a huge demographic dividend to reap. Directing such large -scale schemes in the right manner, across sectors and geographies and bridging the gaps demand through concerted efforts, is a big task at hand for MSDE. It is imperative to provide the right type of skills for the right type of employment which will shape India’s future. “ The world's largest vocational skills competition is scheduled in Abu Dhabi from 14 to 19 October 2017. The ministers felicitated the candidates representing India and extended their wishes. The occasion also witnessed the introduction and felicitation of Japan Technical Interns. “Skill India is a national movement bringing together multiple stakeholders on a common platform to maximise the potential of India’s youth. This day is to celebrate the unified efforts and the convergence in skill training efforts to achieve quality and scale in our ecosystem.” said Dr. K P Krishnan, Secretary, MSDE addressing the audience at the event. 100 GST training centres, 51 Pradhan Mantri Kaushal Kendras and 100 Yoga training centres were inaugurated on the occasion. 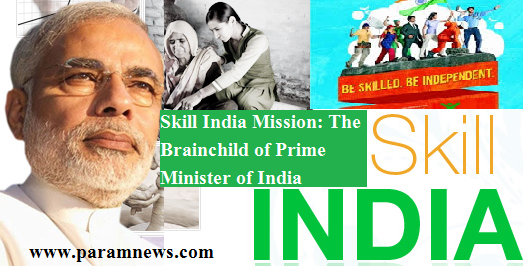 SKILL INDIA Mission is the brainchild of Prime Minister of India, Shri Narendra Modi. It was during his presence, MSDE had launched the SKILL INDIA Campaign on the occasion of the first ever World Youth Skills Day on 15th July 2015.